Anyway I am still looking. I was going to test and post about another app last week, but it turned out so awful it went into trash. 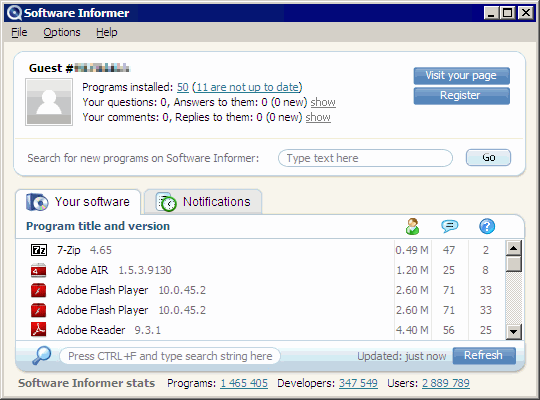 This week I moved on to yet another software updates monitor – Software Informer. As other of its kin Software Informer scans computer for installed software, checks with online database and highlights items in need of update. Process is relatively fast and software database seems quite comprehensive. For me it caught titles most miss – Balsamiq Mockups, Logitech GamePanel software and even Fuppes. On other hand it had missed recent VirtualBox update. Another additional (and not quite fitting) function is launcher (right click Start). App is closely tied with site, that offers informational pages for each software title, where registered users can post comments and questions. Fast update check and comprehensive database. Site seems to leverage data from users, which together with some editorial control is one of the best possible strategies for massive software versions database. App is not portable itself and completely useless to monitor portable software. Versions are most probably pulled from registry, there is no disk search mode (like one in FileHippo Update Checker). It also manages your data bit too freely. Guest account is automatically created and list of your software is published on program’s site in public. No personally identifiable details are posted, but list of software itself can be such. You can make profile private or delete it, still not an excuse for default behavior. Impressive quality of core function, but app is seriously undermined by being oblivious of portable and questionable treating of user’s data. Quest for ultimate software updates monitor continues.